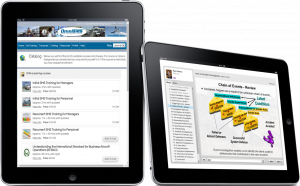 Courses are delivered in your browser or iPad / mobile device with modules that run between 15 and 30 minutes each. A short quiz is delivered at the end of each module. Provide SMS training and qualification for all personnel and managers with single sign-on from within OmniSMS, or login directly to the OmniSMS eLearning Center. Provide SMS safety orientation training to new-hires and newly-promoted supervisors & managers. Revisit and review all completed courses anywhere, anytime, as often as you like. OmniSMS subscribers enjoy discounted training for all employees. As recommended by ICAO’s Safety Management Manual, we use a “building block” approach to SMS e-Learning, whereby each successive course builds upon knowledge gained in the previous course. This approach increases learning retention and also allows managers to fully understand the SMS message being delivered to front-line workers. Quizzes are provided for each course and corrected to 100%. Quiz results may be printed, and designated managers can run activity, completion, and customized reports from directly within the Learning Management System. There’s a lot to learn about Aviation Safety Management Systems! Some industry courses are a week long, and cost thousands of dollars. One challenge facing operators today is to condense this complex field of study into a message that is understood and accepted by front-line personnel, supervisors and managers. Let us bring the training to you! Introduction to Safety Management Systems is an essential course for managers who are developing their own SMS or are about to implement Omni Air Group’s Quality SMS. This course consists of PowerPoint presentations, formal lecture, workbook, sample exercises and open discussion regarding the practical application of SMS in your organization. Contact us to learn more.